Habit: Annual 5--80 cm, +- woolly. Stem: erect to ascending, occasionally decumbent. Leaf: opposite proximally, alternate distally, linear to (ob)lanceolate or ovate, entire to wavy-dentate or shallowly lobed. 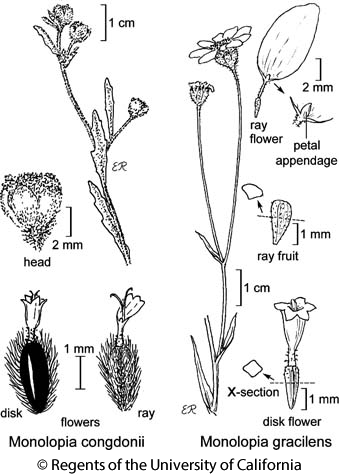 Inflorescence: heads 1 or in cyme-like clusters, radiate (+- disciform); involucre hemispheric; phyllaries 4--11 in 1 series, free or fused into lobed cup, tips black-hairy; receptacle convex to conic, smooth or pitted, epaleate. Ray Flower: 1 per phyllary; corolla generally yellow, with small lobe opposite ray. Disk Flower: 20--100; corolla yellow; lobes 4--5, with glandless and/or glandular hairs; anther tip elliptic-oblong or ovate; style tips oblong, appendages +- deltate, papillate. Fruit: +- obconic, ray fruit 3-angled, disk fruit 2- or 4-angled; pappus 0 or 2--7 persistent scales. Stem: decumbent to ascending, branched from base. Inflorescence: heads +- disciform; peduncle 0.2--2 cm; involucre 4--5 mm; phyllaries 4--7, free, reflexed in fruit. Ray Flower: ray 0--0.5 mm, 3-lobed. Disk Flower: corolla 1--1.5 mm, 4-lobed, bell-shaped; lobes glandular. Fruit: 2.5--3 mm; disk fruit 2-angled, compressed front-to-back, fringed; disk pappus of 2--7 scales, 0.5--1 mm. Chromosomes: 2n=22. Citation for this treatment: Dale E. Johnson 2012, Monolopia congdonii, in Jepson Flora Project (eds.) Jepson eFlora, http://ucjeps.berkeley.edu/eflora/eflora_display.php?tid=80210, accessed on April 25, 2019.
s SnJV. Markers link to CCH specimen records. Yellow markers indicate records that may provide evidence for eFlora range revision or may have georeferencing or identification issues. Purple markers indicate specimens collected from a garden, greenhouse, or other non-wild location.